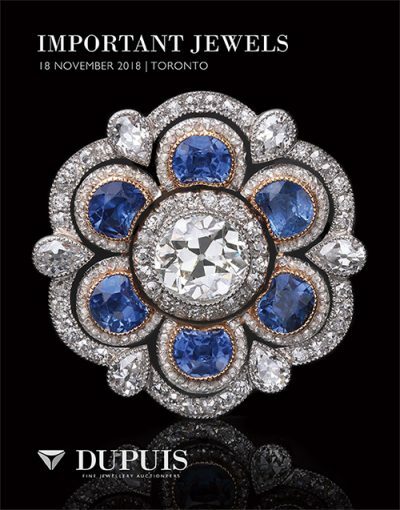 This November 18th, you’ll have the opportunity to bid on diamonds of shapes, colours, clarities and sizes to suit all tastes and budgets. There are over 65 diamonds weighing over a carat, and ranging up to over 10 carats. If the finest colour is on your bucket list, the absolutely colourless “D” may be for you. There are three diamonds with the top colour grade of “D”, two of them with internationally recognized GIA reports. D is absolutely colourless; you can’t get better than that. If exceptional clarity is the place for you, there are diamonds with internally flawless (IF) clarity. One GIA graded diamond is a 3.03 carat marquise gem with the added bonus of having “E” colour, that’s about as good as it gets. Among nine diamonds of over 5.00 carats, there are two that exceed 10 carats. One 10.83 carat diamond is a round brilliant cut gem with the very fine clarity of VVS1, a classic gem. Another diamond, weighing 10.04 carats, is a lovely emerald cut, and is graded as the very fine VS1 clarity by GIA. It is mounted in a lovely ring. Coloured diamonds to be offered in the auction include pink, yellow, brown, and a very unusual “chameleon” diamond that is known to change colour when it is heated or kept in the dark for a period of time. This is truly a conversation piece. Vintage and antique jewels are increasingly popular at auction, and the old mine cut and old European cut diamonds found in these jewels provide an opportunity to embrace a piece of history, and a diamond unlike anyone else’s. Among the antique jewels on offer, a very pretty 2.16 carat old mine cut diamond in a ring that dates from over a century ago is bound to catch your eye. With estimates from a modest $1,800 up to $140,000, your perfect diamond is bound to be waiting for your bid in November 18th. Previews begin on November 5th. Lot 371 An Antique Sapphire and Diamond Brooch, circa 1910.